Facebook formed the Open Compute Project (OCP) in 2011 to meet their need for hyperscale computing platforms. The OCP has since grown into a movement that emulates the open source software community, but in this case it is open source hardware. Initial server and storage designs released as part of the OCP by Facebook have turned into commercial products. Microsoft has openned up its server and rack design to take part in this success as one benefit of the OCP ecosystem is accelerated innovation, the one thing that Microsoft needs as cloud computing picks up growth. Compared to Microsoft’s hardware partners – HP and Dell have been recording dropping sales – OCP hardware vendors are reaping the benefits of cloud computing. Microsoft is also fighting for a bigger chunk of the cloud market along with Google and Rackspace. By joining the OCP, Microsoft hopes to expand the market for cloud servers which already power Bing, Windows, Azure and Office 365. Contributions to OCP include hardware specs, design collateral, system management source code for Microsoft’s cloud server designs which will also be hosted on GitHub. Despite being their use for hyperscale computing, Microsoft cloud servers are optimized to support over 200 online services. This includes gaming platforms to Microsoft’s own Azure cloud. This is one factor that is bound to raise more interest in OCP, currently the project is viewed as being exclusive to hyperscale computing. 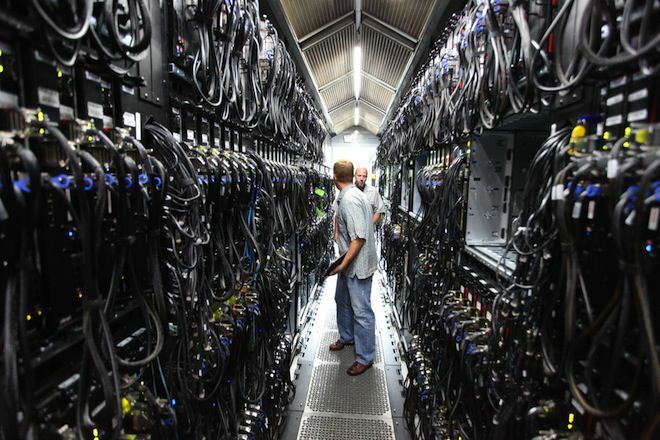 The fundamental block on Microsoft’s infrastructure is the 12U chassis housing 24 half-width blades with power supplies, fans on the chassis level. A shared signal backplane is provided for the system with all cable connections going to the back of the chassis. Sysadmins can quickly swap servers and storage by plugging blades into trays within the chassis. Networking flexibility that can work with 10GbE/40GbE and copper/optical. Microsoft and Facebook (the founder of OCP) are the only cloud service providers to publicly release these server specifications, and the depth of information Microsoft is sharing with OCP is unprecedented. As part of this effort, Microsoft Open Technologies Inc. is open sourcing the software code we created for the management of hardware operations, such as server diagnostics, power supply and fan control. We would like to help build an open source software community within OCP as well. The specifications we’re contributing to OCP reflect our long history in datacenter architecture and cloud computing. We started managing our own datacenters in 1989, and delivered our first global online service, MSN, in 1995. We have invested more than $15 billion in our cloud infrastructure and today provide more than 200 cloud services to 1 billion customers and 20 million businesses in more than 90 markets around the world. Simply put, we have learned a tremendous amount building and operating some of the world’s largest cloud services.